Report on the conditions in the Philippines. Mr. Quezon, the Resident Commissioner from the Philippines, after so arranging by telephone, called on me about noon of Sunday, December 28th, and talked over Philippine matters until 1:15 pm. On the following morning I dictated a rough sketch of what was said. After some general talk Mr. Quezon brought up the question of policy as to the Philippines. He was very anxious to know precisely what the policy of the President was. I told him that I had only a few public statements, including the statement of Governor Harrison quoting the President and the President’s message to Congress, on which to base an opinion, and that I thought that those statements gave very accurately the policy of the President. He said that there was a fear in the Philippine Islands that they contemplated a very early grant of independence; that this worried greatly the Americans and others with interests in the Islands, and that he himself thought it would be a mistake. He said that he wished to advocate an elective Senate with an appointive Governor with a veto not absolute but absolute unless two–thirds of both Houses should vote to override it, and that this two–thirds vote should have the effect of submitting the acts for the consideration of the Secretary of War whose opinion thereon would be final. He said that he thought that the Governor might be prejudiced by some local condition and that a presentation of the case to the Secretary of War, with the pros and cons, would get a better result. He said that the Americans with whom he had talked on this matter in Manila, mentioning by name Bruce, Hartigan and Ross, * had agreed with him on a general plan, with the exception of this matter of veto, they desiring the Governor’s veto to be absolute, and he agreeing to the veto with the qualifications outlined. He said that he was prepared to advocate a new organic act along this line and believed this would settle the question of the relations between the Philippine Islands and the United States for at least 25 years, when it would become a matter of interest to their successors rather than to those people now living. He said that there would perhaps be a little more difficulty in getting an agreement to this now than there would have been a few years ago, in that independence had now acquired an attractive sound to the ear of the Filipinos. He expressed his fears of independence in the near future, basing his fears largely on the conduct of Japan. He said that on this trip for the first time he became convinced that the Japanese had designs on the Philippine Islands; that he had been approached in a way to indicate this and that he believed if the Japanese became convinced that independence would come in the near future there would be an immediate beginning of officially assisted emigration of Japanese to the Philippine Islands, and that the Japanese would remain Japanese and would not be assimilated by the Philippine people. He said that this was not the case with the Chinese and that he would gladly see 500,000 Chinese admitted to the Philippines at once. He said, however, that before he would advocate anything short of independence or short of what he had been talking for heretofore, he would like to feel that it would meet the approval of the administration in that it would necessarily lose him all of his old friends, the extreme anti–Imperialists, and he would not like to go ahead without feeling that he would have the backing of some part of the community. I suggested to him that he might talk to the Secretary of War. I asked him if he had explained this view to Mr. Osmeña. He said that he had, and that he thought Osmeña would be all right. I told him that it would perhaps be very hard to get people here to commit themselves to a policy which did not appeal to the Governor–General on the ground, but he said that he would have been afraid to have risked any such suggestion to the Governor–General. On his again returning to the President’s views, I told him that I had nothing to go by except the public documents; that I did not think the President contemplated any independence which would leave a state of chaos or anarchy in the Philippine Islands; that he had the Democratic platform to go by and that he had outlined the taking of one step and the observation of the results, and the taking of another stop when it could be safely done, having always in mind the welfare of the Philippine people, and that I thought this was about as definite a statement as to times as hould be made. I again suggested to him the advisability of talking with the Secretary of War and explaining to him his ideas. On December 29th I saw Mr. Quezon from 12 to 2:30 pm. While going generally over the same matter as to his view of the policy in the Philippine Islands, nothing new was developed. I dictated, later, a resume of the general conversation because of interest in certain personnel of the Philippine government. Since, Mr. Quezon has called in the office on January 2, 5, 6, 12, 13, 15, and 16, always, in addition to general talk on Philippine matters, dwelling 0n his desire to get some definite legislation which would allay talk of independence in the near future. He spoke of having seen, among others, Mr. Slayden, of Texas. He said that Mr. Slayden, and he believed a great many other Southern Democrats, simply wanted to get rid of the Philippine Islands and that they did not care what happened to them; that their interest was what they conceived to be the interest of the United States. He said that this, he believed, was originally Mr. Jones’ view but that, through associations with himself and other Filipinos he believed that Mr. Jones was more sympathetic towards the Philippine people, but that his original desire to get rid of the Philippines without reference to what might subsequently happen to them still controlled his views. He said that he had seen Mr. Jones in Baltimore and subsequently here in the city and that Mr. Jones told him that he was preparing a bill which would grant absolute independence to the Philippines within three years, and that he was afraid that he had impressed Mr. Jones unfavorably in standing out against that. Mr. Quezon told me that he desired to prepare a bill for submission to the Secretary of War and to the President which would embody his views and which would, he thought, appeal to the Philippine people and would put at rest any agitation for immediate independence. On January 13th he left with me his notes as to what he would like to have the bill include and asked me if I would assist him in preparing a bill embodying these ideas; that he did not wish to commit me to approving the ideas but that he would like to have, after the bill was prepared, my candid criticism as to its features. I prepared a bill in accordance with Mr. Quezon’s views, which I gave him on January 15th, and on January 16th we went over the bill together. He said that he believed that it was all right in so far as his ideas were concerned but that he had become impressed, or at least that his present feeling was, that it should be changed in one respect. that the trade relations between the United States and the Philippines should be subject to the exclusive control of the Congress of the United States but the President could negotiate trade treaties affecting the Philippine Islands and not of general application to the United States. Briefly, the government of the Philippine Islands was to be almost completely autonomous, Congress reserving the right to annul laws of the Philippine Congress, as at present, and certain laws of a general character not taking effect until receiving the approval of the President of the United States. This would be, in addition to the laws enacted above, all those which would in any way affect the foreign relations of the United States. With the exception of the officials mentioned, all officers of the government would be appointed by the Governor–General, by and with the advice and consent of the Philippine Senate, pursuant to laws of the Philippine Congress. “That in 1915 and every tenth year thereafter the President of the United States shall cause a census of the Philippine Islands to be taken under regulations to be prescribed by him. At the final talk which I had with Mr. Quezon he said that he had decided that for effect it would perhaps be better that the Congress of the Philippines should be created by a constituent assembly rather than by the present legislature and that perhaps it would be better to have the Governor–General call a delegate convention of the people of the Philippine Islands and to permit this delegate convention to draw up the laws, subject to the approval of the President of the United States, providing the form of internal government of the Philippine Islands, including the form of congress; that he himself very much favored a parliamentary form of government and that he thought that this constituent assembly could be so guided as to embody in their Philippine constitution about everything which the President would desire to have embodied therein. 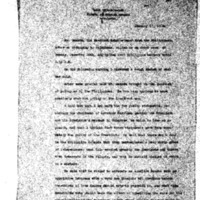 He explained, on practically each call, that the Section quoted above referring to complete independence of the Islands did not appeal to him; that he would rather that there would be no such Section, but that he believed that it would appeal to the President in view of his expression in favor of ultimate independence, and would appeal to the more extreme Filipinos, as well as to these people in the United States who had taken so strong a position in favor of independence. By requiring that this question of independence should not again be taken up until the President wase satisfied that”75 per centum of the male adults of the Philippine Islands can read and write intelligently in any language or 60 per centum of such male adults can read and write intelligently the English language” he felt that the matter was almost indefinitely postponed, as that condition could not within the lifetime of people now living be satisfied. McIntyre, Frank, 1865-1944, “A Memorandum on Manuel L. Quezon,” 1914 January 17, WWP18290, First Year Wilson Papers, Woodrow Wilson Presidential Library & Museum, Staunton, Virginia.